When it comes to making decisions pertaining to your career, you should ensure that you think carefully about taking any big steps. If you decide to leave a job for whatever reason, chances are that the HR manager might set up an appointment with you in order to ask you certain questions. Such an appointment is known as an exit interview. Various individuals have different feelings towards exit interviews. No matter what your feelings are towards exit interviews, you should ensure that you are never crossing out of line. How to Handle an Exit Interview? There are many people who make use of the mistake of using the exit interview as a chance to start bad mouthing the company. The manner in which you speak at the exit interview will really point to the kind of individual you are. One of the worst things which you can say during an exit interview is that the company will surely be at a loss without an employee like you. No matter how good an employee you think and know you are, you should never try to blow your own trumpet too hard. If you are good, people will sit up and take notice of you. Either way, now that you are leaving the company, it is better not to try to make a row before you leave. Even more important than what you say, is the way in which you communicate your ideas. Just because you are leaving the company that certainly does not mean that you throw caution to the wind and just start speaking in a crude as well as unacceptable manner. Even if your experience has not been pleasant in the company, you should try your best to leave on a happy note. This interview may not be carried out in a very formal manner, but you should give the individual his due respect. Believe it or not a bad word against you in the business world could cost you dearly. Whether you will admit or not, you are likely to learn something new in each company you join. Each company you are a part of will teach you some lessons, either on a personal level or in terms of your professional wisdom. At no point in time should you make the mistake of saying something negative about the person who you worked under. Even if you considered him or her to be a terrible individual, you should just withhold your anger and not say fowl things. Believe it or not, hardly any employee likes his boss, so there is no need to point out any negative things about him or her. When you have worked in the company, it is likely that you have spent quite a bit of time with your co workers, no matter what you personal or professional opinion of them is, you should never say things about them which is likely to show you as someone who is both bitter as well as jealous. Since you are leaving the company, with possibly no intention to come back, it is unlikely that you will be seeing these people again. An exit interview is certainly not the time or the place for you to go on a rant, making personal comments about all the workers in the office. No matter what position you held in the company, an exit interview is not the time for you to start criticizing in detail the companies rules or policies, which according to you maybe bad or ineffective. No matter what you say or what opinions you happen to put forward, it is very unlikely that things are likely to change because of your words. So just take the exit interview as your last responsibility or duty to the company and do not rattle your brains about it too much. Answer each question to the best of your ability and do not say things which can land you into trouble in the time to come. No matter how angry you are about leaving the company or about some decision you made while working for the company, you need not take out your pent up anger at the exit interview. There is no need to treat this exit interview as a counseling session as that will make things very unpleasant for both the parties. Just answer as per the questions which are asked and do not go of on to a tangent of your own. If you are acting in an appropriate manner, the interview will be done in a matter of a little while. The interview will be long and awkward, if you make it so. Employees in every company love gossiping. Sometimes the gossip is of a harmless light hearted nature and other times it takes a vicious form. One of the worst things which you can do when at an exit interview is start indulging in gossip or spreading some rumors which you have happened to hear. Depends on the nature of the interviewer, he or she will either stop you at the onset or egg you on. HR managers are usually very professional in their working manner and usually never stoop to such a low level. So never show yourself to be a gossip monger at any cost. After letting out their pent up manner, there are many foolish individuals who go on to speak in a threatening manner, or even worse is that they issue open threats to others in the company. Doing this is not only going to show you to be someone who has absolutely no decency but it is also likely to get you into a lot of legal trouble. No company likes trouble makers and it will only take one or harsh words from your end to really let out the company’s ruthless side. Company workers and personnel are good to you as long as you are good to them, the moment you go too far, things are bound to get ugly. No matter how great the company which you are joining is, or how promising your future looks from now on, you should never try to brag too much. There is some truth in the common saying that pride has its downfall and the moment you get too proud, fate is bound to play some cruel trick on you in order to get you back to earth. Humility is a quality which is rather rare to find nowadays, but you should try and be as humble as you can at all costs. You should let your accomplishments and resume speak for itself. The HR manager might seem really interested in what you are saying, but chances are that he is preoccupied with a lot of other work which might be pending for him to complete. So if you genuinely have something to say then say it in a clear and concise manner, do not beat around the bush. If you have managed to come up with a solution for a problem which the company has been facing for a long time, there is no need to disclose the solution at the exit interview, your responsibility to the company is officially over and you are no longer obligated to find solutions to their issues. There are many individuals who say ‘no comments’ in response to a question which they would not like to answer. Yet at an exit interview, giving such a response might seem rather rude. In regard to the question which has been asked, you are sure to have an opinion after working in the company for a considerable period of time, so there is no need to shy away from answering the question. As mentioned above you ought not to use vulgar language during the exit interview, but that certainly does not mean that you need to sugar coat every unpleasant thing which you say. If you have managed to bag a good job after working in the company for a while, chances are that you might be feeling very confident and good about yourself, however that certainly does not mean that you need to start acting too smart and smug about yourself. Never make the mistake of saying that you would never return to the company at any cost in the future. A common question asked during the exit interview is that ‘Are you likely to join the company again?’ to which many people reply ‘ No way!’ . There is no need to be this blunt during the interview. Irrespective of how you think the future of the company is likely to be, you should ensure that you do not make any controversial statements during the exit interview. Try your best to answer as neutrally as you possibly can as that in fact is the ideal thing to do. So if you are asked about what you think the future holds for the company, say that the company is very promising and with hard work and dedication, things are likely to head uphill further. Saying something positive is certainly not going to hurt you in any way. Being diplomatic is mandatory when trying to survive in the business world. Even if you think such an exit interview is a wasted exercise, you ought not to speak or dress in a casual manner. Do think seriously about the questions which are asked to you and speak in a manner which you think is best. Based on the questions asked by the interviewer as well as his body language, you will be able to grasp how seriously he is taking the interview. So after gauging this, answer accordingly. 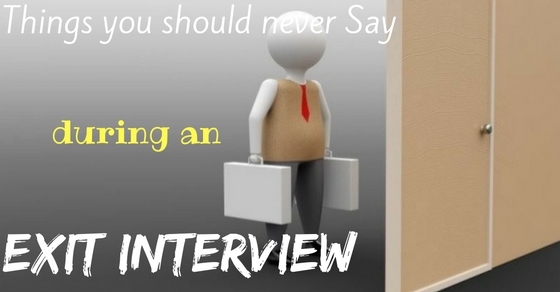 If you take the interview too lightly you are bound to antagonize the interviewer. In the course of the interview no matter what you decide to say, be confident yourself and do not say anything which you might end up regretting in the time to come. The business is very unpredictable and you can never tell when you might need someone’s help. Burning bridges is always a bad idea. The larger network you have the better things will be for you. So do not let one exit interview ruin your future. Every word you speak and action you carry out should be after careful consideration, else you might end up with feelings of regret later on. Based on your experience in the company and the note on which you are leaving, you should decide accordingly what kind of answers you will give to the questions which are being asked to you. There is no need to get flustered or nervous, because this is just protocol or formality which the company carries out. So do try and be as honest as you can and there is no need to provide lengthy answers as no one has the time to listen to them. You will need no major preparation for such a kind of interview, but ensure that you do not accidentally say any of the above things when asked a question.